Who could have possibly predicted that not only would Olivier Assayas and Kristen Stewart combine to form one of the most potent creative duos working in film today, but that they would achieve such prominence over the course of only two movies? Even with their individual impressive resumes before their first collaboration, "Clouds of Sils Maria," it became one of Assayas’ most acclaimed films to date and Stewart’s performance received raves around the world, earning her the honor of being the first American actress to win the Cesar, France’s equivalent of the Oscar. They have now reunited for “Personal Shopper,” and despite the high-water mark set by their previous collaboration, they have managed to out-do themselves with a work as mysterious, moving and haunting as anything that has materialized in a movie theater in a while. The word “haunting” was not chosen lightly for “Personal Shopper” which is, at its heart, a ghost story. It begins as self-described medium Maureen (Stewart) arrives at a rambling old house in the hope of contacting the spirit that may be residing within. This isn’t just business for her, in this case. The home used to belong to her recently deceased twin brother, Lewis, with whom she shared everything from a womb to an interest in the paranormal to the heart defect that took his life. Lewis had promised that if he passed away first, he would try to send a message from beyond the grave that would let her know A.) that he was at peace and B.) that there was such a thing as the afterlife. Over a series of long and increasingly creepy shots, we observe Maureen as she wanders the darkened halls, calling out Lewis’ name and looking for some clues to suggest that he has made contact, but she finds nothing. As for us viewers, it is a slightly different story. Maureen’s day job is as an assistant to Kyra (Nora von Waldstatten), a world-famous movie star for whom she runs errands such as picking up and returning the designer clothes she is constantly photographed in. Maureen is not particularly thrilled with this career path (especially when it comes to getting Kyra to actually return the things that she has “borrowed”), but she is as good at it as one can be, possibly because of the unspoken similarities with her interests as a medium—in both cases, she is dealing with people who aren’t there physically but who still manage to maintain a presence that takes up an enormous amount of psychic weight. As Maureen continues running errands for Kyra—even surreptitiously trying on one especially glamorous dress herself—her two worlds begin to collapse into each other as Maureen begins receiving a series of mysterious text messages that seem to know everything about her, and which she thinks may be coming from her brother. Like many of Assayas’ films over the years, “Personal Shopper” starts off by identifying itself as one specific thing before changing in often radical ways. In this case, Assayas starts off by announcing his film as a ghost story of a traditional sense—and indeed, the opening sequence alone beats the entire “Paranormal Activity” series by building a genuinely gripping state of suspense that will thrill even the jaded genre junkies. While still maintaining the quiet dread of those opening scenes, he then shifts the narrative in ways that offer up new notions of what constitutes a ghost story. There is Kyra, of course, who so rarely puts in an actual appearance that to the increasingly put-upon Maureen, she might has well be a spirit, albeit more spoiled than spooky. At the same time, it could be argued that Maureen is the ghost in her own story—not only is she still inextricably linked to her late brother, body and soul, but when Maureen does actually get face-to-face time with Kyra, her employer gives so little acknowledgement to her presence that she might as well not be there at all. Then there are those strange and increasingly creepy text messages that Maureen receives. Is this the long-awaited message from Lewis that she has been waiting for all this time? That's clearly what she is hoping for but there is also the possibility that it could be another, darker spirit that has managed to make contact with her. Then again, there is the even-more-frightening possibility that the messages are coming from a flesh-and-blood stalker who is leading an already-distracted Maureen into real and immediate danger. That Assayas is able to juggle all of these potential possibilities, maintaining their respective mysteries without letting things get too lurid or ridiculous, is a testament to his incredible skills as a filmmaker. Aiding immeasurably in accomplishing this is Stewart delivering what could be the finest performance of her still-developing career. Throughout the film, she is required to display any number of internal shifts in personality while still remaining more or less the same on the outside. To each shift in character, she manages to find an approach that does something wholly new and original while at the same time being absolutely real and recognizable. She saves the best for the very last with a delivery of the film’s final line that is extraordinarily evocative. To all those who still decree Stewart to be a limited actress because of her increasingly glum turns in the “Twilight” films, where she was dealing with writing and characters seemingly designed to defeat anyone with talent or intelligence, they are hereby advised to see her work here and either admit to her enormous talents or admit to the fact that they have absolutely no idea of what constitutes great acting. Because Assayas’ storytelling can sometimes be described as oblique and because there are elements of the narrative, especially towards the ending, that have been deliberately left unresolved, there is the possibility that some viewers—especially those who prefer films where all the plot lines are brought to a satisfactory conclusion—may come away from “Personal Shopper” feeling a little frustrated with the way that some seemingly important things have been left hanging. All I can say to that is that if that's your primary requisite for a movie, there are plenty of films like that out there. 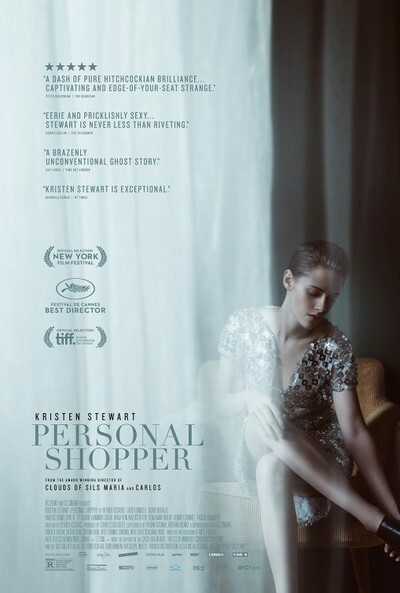 However, if you want to see a movie that offers thoughtful meditations on materialism and mortality, includes a couple of sequences so quietly hypnotic and stylish that Hitchcock himself would have bowed down in sheer admiration, and is centered around what is sure to be one of the best performances to grace movie screens this year, “Personal Shopper” is an incredible work that will continue to haunt you, long after it is over.